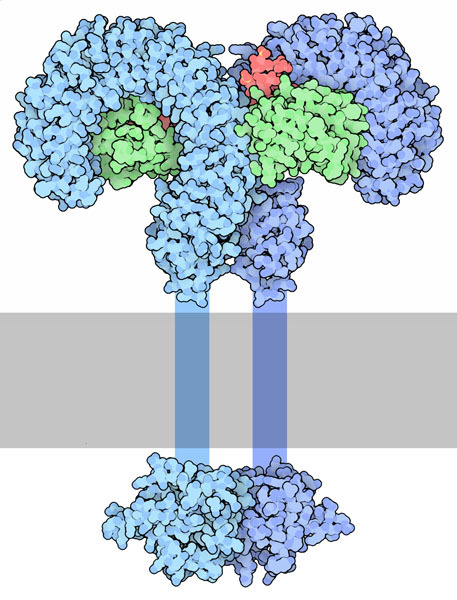 Toll-like receptor 4 (blue) bound to bacterial lipopolysaccharide (red). The portion that crosses the cell membrane is shown schematically. The world is filled with bacteria and viruses, all eager to infect our cells. We have two lines of defense against this constant assault. Our first defense is the innate immune system, which stands guard against the most common attackers and mounts a quick defense when they are found. This innate system is found widely in animals, plants, and fungi, and for most, is their only line of defense. Vertebrate animals, however, have a second line of defense: the adaptive immune system. It is brought to bear if the problem is more severe, using custom-built antibodies and a powerful force of white blood cells to battle the invaders. The innate immune system is hard-wired to battle common foes: for instance, the Toll protein in fruit flies specializes in recognizing bacterial and fungal infections. Our own cells contain 10 proteins similar to Toll, called "Toll-like receptors," that each recognize distinctive molecules from bacteria and viruses. 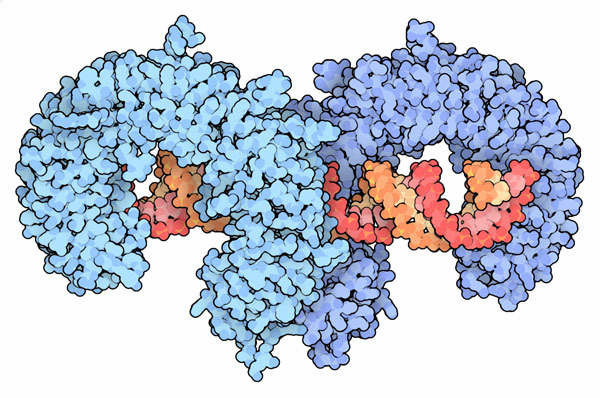 The one shown here recognizes lipopolysaccharide (shown in red), a molecule that is found in many bacterial cell walls. When they find these foreign molecules, Toll-like receptors mobilize an inflammatory response that fights the pathogens. This response is very important: for instance, mice that are deficient in one step of the Toll-like receptor signaling pathway often die of infections from the normal bacteria found in their mouths. Like many receptors on the cell surface, Toll-like receptors transmit their signal into the cell by forming a dimer. The receptor spans the cell membrane, with a large horseshoe-shaped portion outside and a smaller domain inside. The pathogenic molecule, such as? lipopolysaccharide, brings together two copies of the horseshoe-shaped? portion outside the cell (shown here from PDB entry 3fxi ), bringing? together the cytoplasmic domains (shown? here from PDB entry 2j67 ) and? initiating a cascade of signals inside the cell. Extracellular domains of toll-like receptor 3 bound to DNA. The trick, of course, is to have Toll-like receptors that recognize unfriendly molecules but not our own molecules. Structures have been solved for several different types. The one shown here, from PDB entry 3ciy and including only the extracellular portion of the receptor, recognizes segments of double-stranded RNA that are at least 35 nucleotides long. Long pieces of double-stranded RNA are rare in our cells: transfer RNA and microRNA typically have shorter double-stranded regions. So, a long RNA double helix is a strong signal that a virus is present. The distinctive horseshoe shape of Toll-like receptors is formed by a repeating amino acid sequence, termed a "leucine-rich repeat." This motif is used in many other proteins, and particularly in proteins that bind to other proteins. 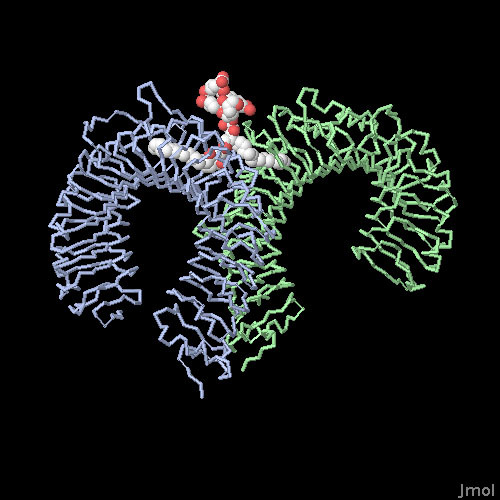 In some cases, such as ribonuclease inhibitor (PDB entry 1dfj , not shown here), the protein binds where you might expect: inside the horseshoe. In the Toll-like receptors, however, the target molecules bind in a pocket on the side of the horseshoe. This is particularly apparent in the Toll-like receptors that recognize bacterial lipoproteins, shown here from PDB entry 2z7x , where a deep pocket in the receptor encloses the lipid chains. To take a closer look at this structure, click on the image for an interactive Jmol. Several structures are available for the monomeric form of Toll-like receptors, before they have encountered their target ligands. For instance, compare the monomeric form of TLR2 in PDB entry 3a7c with the active dimer in PDB entry 2z7x. Ribonuclease inhibitor also contains leucine-rich repeats that form a horseshoe-shaped protein. However, the curve is much tighter in ribonuclease inhibitor. Use a cartoon or backbone representation to compare the secondary structure of TLR2 in 3a7c and ribonuclease inhibitor in 1dfj, and notice how the alpha helices on the outer edge force the protein into a tighter curve. J. A. Hoffmann and J. M. Reichhart (2002) Drosophila innate immunity: an evolutionary perspective. Nature Immunology 3, 121-126.